Serial Report Chapter 76-Sir Galahad, George Reeves, Bradley Page, Frances Robinson. 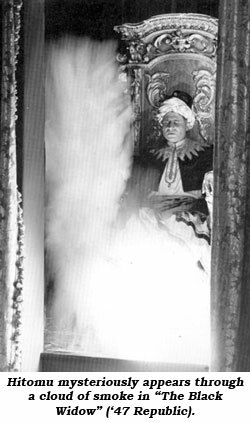 manipulated an array of controls which allowed a turban bedecked Hitomu to appear from a cloud of smoke, a seemingly instantaneous materialization from his native land to an ornate chair in his daughter’s lair. Hitomu magically appeared six times in the 13 chapter serial (Ch. 1, 2, 4, 6, 9, 13). In episode 13 mystery fiction author and criminologist Steven Colt (Bruce Edwards) shot through Hitomu’s smoky departure, plunging the Asiatic dictator to his death. 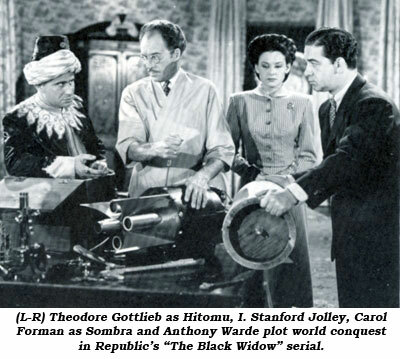 As Brother Theodore, the diminutive Gottlieb’s real life career was as interesting—if not more so—than that of Hitomu. Born November 11, 1906, to great wealth in Dusseldorf, Germany (his father published 52 fashion magazines worth millions) Gottlieb attended the University of Cologne. When Hitler came to power, Gottlieb fled with his family to Vienna. He was taken to Dachau prison on his 32nd birthday only to be released when he signed over the family fortune. 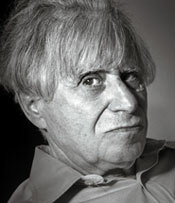 Eight members of his family died in the Holocaust including his parents and grandmother. 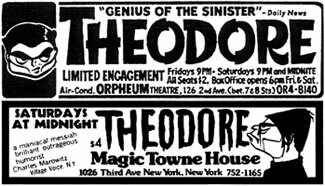 Theodore went from Dachau to Switzerland where he supported himself as a chess hustler. This violated Swiss law and he was deported to Austria. Professor Einstein, said by some to have been the lover of Gottlieb’s mother, helped Theodore get to the U.S.
to defeat 30 professors at chess—simultaneously. 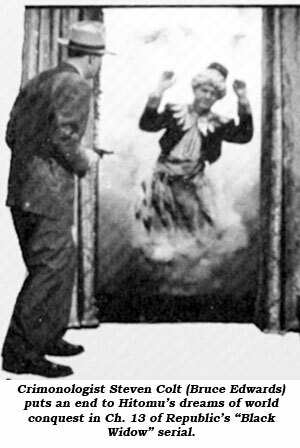 Later, working as a dock worker in San Francisco, he put on his first one-man show by reading Edgar Allen Poe poems. Next came a stint in Hollywood where he obtained a part in Orson Welles’ film “The Stranger” (‘46) and other small roles. His role as the nefarious Hitomu came in ‘47. With the arrival of television he made regular appearances with Steve Allen and Jack Parr on the “Tonight Show” in the mid to late ‘50s and with Merv Griffin and Joey Bishop in the ‘60s and ‘70s. 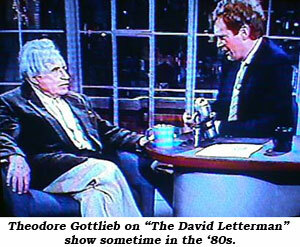 He later emerged as one of David Letterman’s regular guests in the ‘80s. He also was a comedy writer for Billy Crystal in the ‘80s. Gottlieb twice played Gollum…first in “The Hobbit” (‘77) and “Return of the King” (‘80). Several other film roles came his way in the ‘70s and ‘80s. The smoke-filled netherworld abyss he so often referred to caught up with him at 94. Hitomu died at Mount Sinai Hospital in Manhattan on April 5, 2001. 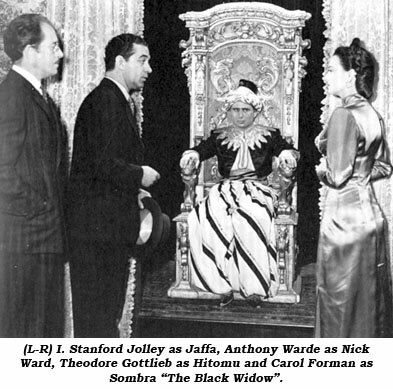 Virginia Lindley, co-star of Republic’s “Black Widow” (‘47), once studied for a career as a violin virtuoso. She gave her first concert at Redondo Beach, CA, in 1940. When the USO camp shows began with the outbreak of WWII, Virginia toured the Army camps giving concerts. Upon her return, she enrolled at Pasadena Playhouse and studied acting for two years. Modeling by day, she acted in the evening at the Bliss-Hayden Theatre, then made her screen debut in “Dragonwyck” (‘46) at Fox. Next came her role in “Black Widow”. At this point she changed her name to Virginia Lee and continued to work in films such as “Parole Inc.” (‘49), “The Robe” (‘53) and others. She also was billed as Virginia Ann Lee in “Annie Oakley: Annie and the Texas Sandman”, several “Death Valley Days”, “Get Smart”, “M*A*S*H*” and in films “Hawaiians” (‘70) and “Lost Horizon” (‘73). Instead of a sidekick or comic relief, many other Western serials employed two heroes to share the action load, while others used the adult hero and a juvenile star…but those are both surveys for another time. Ada Ince was born Ada Williams in Louisville, KY, in 1913. She won a Miss Florida beauty contest and became first runner up in a Miss United States contest. Her film career began in 1928. In ‘29, at the age of 18 she married William Thomas Ince, son of the noted film producer. 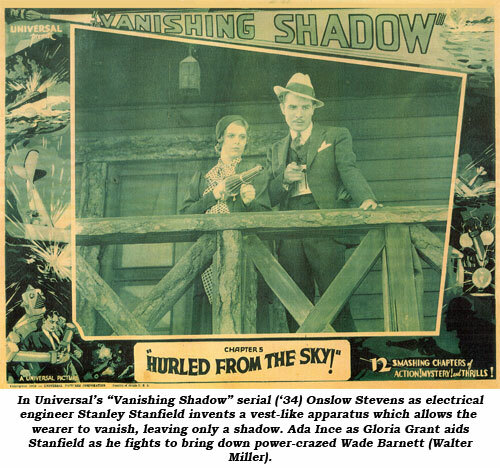 She took the screen name Ada Ince and appeared as the leading lady to Onslow Stevens in Universal’s “Vanishing Shadow” serial (‘34) and “Frontier Days” with Cody. “Rainbow’s End” (‘35) w/Hoot Gibson ended her brief eight film career. Divorced from William Ince in ‘34, the following year she married long-distance runner Ray Dodge who had competed in the ‘24 Summer Olympics. She died at 62 in Blowing Rock, NC, in 1975.